THE STORY - The story of Mary Magdalene. THE GOOD - If it can maintain the interest of a staunch Atheist for two hours it must be doing something right. Technical elements are on point. THE BAD - It tries to appeal to everyone and succeeds in winning no one. ​​Fresh from his critically acclaimed and Oscar-nominated drama “Lion," director Garth Davis has taken a big gamble on a project so early in his career. Only his second feature film, “Mary Magdalene” attempts not only to chronicle the story of Jesus’ path to crucifixion through the eyes of the one closest to him but offer an argument for her martyrdom in the face of overwhelming negativity about her character. Nobody can doubt Davis’ courage, though perhaps the only thing he succeeds in is proving why Bible biopics are typically reserved for more accomplished directors. The story begins with Mary, played by Rooney Mara, as she struggles to cope within the confines of a patriarchy. Her disobedience to marry whom her Brother and Father have chosen is met with hostility, and her outspokenness is thought to be the work of a demon. From the first act, Garth Davis makes it abundantly clear this is not really a film about Jesus (Joaquin Phoenix) or even Mary, but an important commentary on social equality. Many successful period films employ a similar tactic, displacing current national anxieties or social movements into another era to make the political message more discreet, and therefore more palatable to wider audiences. “Mary Magdalene” should at least be praised for trying to do something relevant and important to today’s world, especially when one considers the cruel bit of irony of having this be the last film tied to Harvey Weinstein and his former production company. However, the character of Mary, who is depicted as some kind of 1st-century suffragette is wholly implausible. And while we’re talking plot holes, let’s just consider how Mary, through months of pilgrimage with Jesus and the apostles across the African desert landscape and night after night of sleeping in caves, manages to maintain immaculate hair and makeup. One of such many mistakes Davis makes throughout his sophomore effort. The film manages to barely keep interest, though never once seems to plateau. Of course, we know how this will end, which is precisely why there should be another hook. However, as Mary’s story is increasingly entwined with Jesus, the narrative is framed around his crucifixion. Sure, she gains an emotional epiphany and learns to become a strong independent woman but by now this feels like a supporting arc to imbue his resurrection with maximum drama. The closing credits acknowledge the Vatican’s recent decision to recognize Mary as ‘an apostle to the apostles’, whilst highlighting mass opinion ("Misconception" in Universal’s words) that Mary was a prostitute. 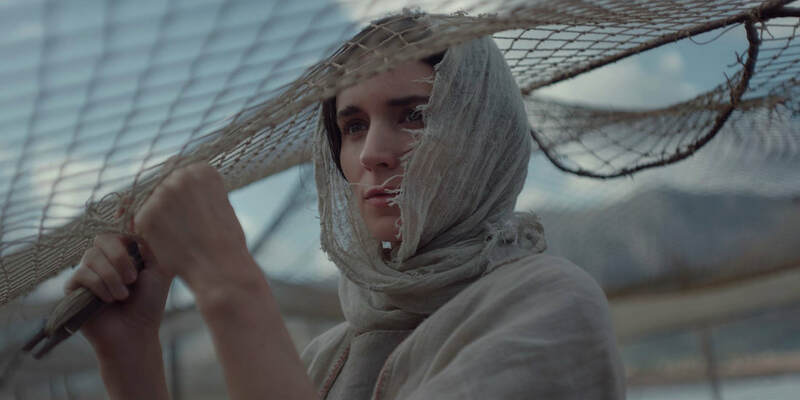 Indeed, popular myth suggests Mary and Jesus were in love, and though Davis nurtured a strong on-screen chemistry between Rooney Mara's Mary and Joaquin Phoenix’s Jesus, he was deliberately reluctant to explore this element further. The desire to tell a story from a different perspective, in an attempt to challenge what we understand as historical truth, is admirable. Combined with the film’s clear social agenda to present a strong female lead fighting to get her voice heard in a violent patriarchy, the film has clear appeal to those with different or no faith. Therefore, in some degrees, we can call “Mary Magdalene” a roaring success. Unfortunately, biblical adaptations are always doomed to be hated by someone. Either the film is too narrow in its appeal, too religiously biased that it alienates much of its audience, or it takes too much creative license and creates something so loosely based on its source material that it fails to win endorsement from the Christian or Jewish communities, which is always a PR disaster. If the film fails it would not be from lack of effort from the filmmakers, whose vote of confidence is evident from their Oscar-nominated cast and global theatrical release. “Mary Magdalene” tries to straddle the line between religious sensitivity and cinematic appeal. The result is two hours of watchable droll which feels like something you’ve heard before and not something you would watch again. The costumes, cinematography, score (The last by the late Johann Johannson) are all on cinematic display and Garth Davis certainly deserves an honorable mention, as these things are usually a passion project taken on by directors with nothing to lose, but he certainly hasn’t converted this film fan.